If you’ve read Leveling Up Your Regency Look: Part 1, then you’re all ready to start building your Regency ensemble. You’ve figured out which part of the Regency you want to represent, and you’ve thought about how time of day, social situation, activities, and character might affect the way you dress. In this part, I will go through my best advice for building a Regency ensemble. I’m not going to get into the nitty-gritty of garment construction and sewing here. For that you can look through some of the project diaries in the Regency section of the Projects menu above. In this post I want to talk about the details and steps that can help bring your Regency outfit to life. These are the things that can take the plain, white, empire-waist dress that is our cultural mental image of the Regency, and make it truly look like you just walked out of the period. In Part 1, we talked about garment structures, and how they changed throughout the Regency period. All those varied bust and skirt shapes are not merely the result of a certain cut of dress; the dresses work with the undergarments to create the fashionable silhouette. 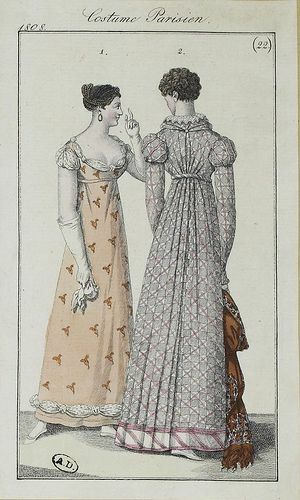 The first silhouette, from 1796, shows a natural waistline, with with a natural bustline somewhere around the upper arm. The skirt is full, and supported out away from the wearer’s body. 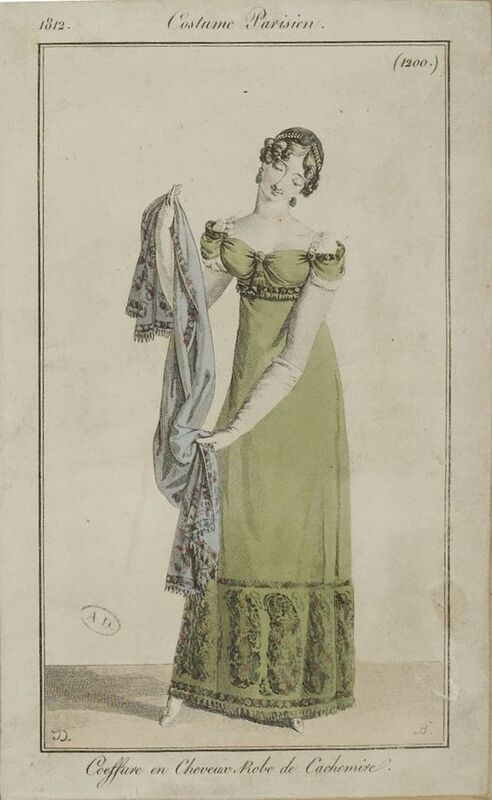 The second silhouette, from 1810, is drastically different: the waistline is high, and the bust more in line with the shoulders than the upper arm. The skirt is narrow, flat across the front, and clings much more than the first around the hips and legs. So what all goes under there? The under-most garment of all is your chemise. This is the Regency equivalent of an undershirt. It is a garment worn next to the skin, and is basically there to a) protect the wearer from any pinching or squeezing from her stays, and more importantly b) protect the outer garments from sweat and oils. It’s not a garment that adds much to the silhouette, but it is very important for keeping you comfortable. Although sleeve lengths varied, chemises remained largely the same throughout this period: loose fitting, usually around knee length, with either a fixed or drawstring neckline and sleeve gussets in the armpits. On top of the chemise come arguably the most important piece in your Regency wardrobe: the stays. Many people think of the “natural” look of the Regency being achieved without any shapewear, but not so! While many Regency stays are certainly more minimal than corsets and stays from other periods, they provide shaping that is absolutely essential to achieving your desired silhouette. As the changing bust shapes and waist placement of the period make evident, there is no one pair of stays that will get you from 1790 all the way up to 1820. The stays of the early 1790s are very similar to what we see in the rest of the 18th century: conically shaped, but shorter than those from earlier in the century. Through the 1790s and early 1800s, we see all sorts of interesting forms as fashion went through the shift from 18th century to early 19th. For the most part, these consist of stays with bust gussets which extend several inches below the bust in order to provide support underneath and help lift the bust. The gussets are the key here–they separate the breasts, creating a very different look from the smooth, uni-bust of the 18th century. The stays usually end in tabs around the waist, which help protect the wearer from being poked by allowing the ends of bones to spread away from the body, but not always. Nothing is settled in this particular part of the regency. Finally, some time around 1805, we reach a corset style that will last, with some variation to accommodate currently fashionable silhouettes, all the way up until the Victorian corset replaces it in the late 1840s/early 1850s. This is what we now call long stays: a full-torso garment with both bust and hip gussets, corded, rather than boned, for mild support, with a stiff, center-front busk to keep everything from collapsing, and provide that all-important bust separation. Unless you are interpreting the very early Regency, you can’t go wrong with a pair of long stays. If the idea of making stays scares the pants off of you, have no fear. Custom or pre-made stays are available from a number of vendors like RedThreaded. RedThreaded will even be set up at the festival, so if you want to try on her wears, or learn about stays from someone with much more specialized knowledge than me, go seek her out! Finally, you will need petticoats: the amount and style of these varies a lot throughout the period, and usually mimics the style of the skirt. If the skirts are full and gathered, so are the petticoats, if they are flat at the front with an A-line silhouette, ditto. The farther you want your skirt to stand out from the body, the more you will need. If your aim is the narrow, drape-y shape of the early-mid 18-aughts, you may want only one, or even none. If you are in the early 1790s, you will probably want several full petticoats. If you are in the 18-teens, at least one petticoat stiffened at the bottom with tucks or helped along with a ruffle or two will be necessary to give you the A-line look, with more added as the hem gets wider later in the decade. It may seem counter-intuitive that adding more layers could make you more comfortable, but believe me when I tell you this: petticoats made from a sturdy material help keep your skirt from tangling between your legs, and for that reason, I would never be without them. The high Regency waistlines mean that petticoats can’t support themselves by sitting at your narrowest point, instead, they either have straps, or small bodices, which can also help give you a nice, clean look under a more sheer gown. Petticoats, especially bodiced ones, don’t have to be white! Colored ones were often worn under sheer gowns. As you are preparing to make your Regency ensemble, study the undergarments that go with the year you are trying to represent. Remember, especially in the early half of the Regency, there is a lot of overlap between different kinds of undergarments, so you may have several options. Think about what will make you the most comfortable while still creating the desired silhouette. 2. You aren’t making the pattern. This is a favorite statement of my dear friend Amy: you aren’t making the pattern, you’re using it as a tool to make the dress you want. There are quite a few Regency dress patterns available, both from the “Big 3” commercial pattern companies, and from smaller companies that specialize in historical patterns. Personally, I would always recommend working off of a pattern from one of these specialized companies, who tend to have a better knowledge of period construction and styles. However, even if you are using a pattern, you don’t want to let it rule your life. The pattern is there to help you, not to force you to make a dress you don’t want. While there are Regency patterns available, there are many parts of the Regency that you won’t find an exact pattern for, and even if you can, that exact pattern won’t necessarily work well for your taste or your body. Make a mock-up or two, get comfortable with the shapes of the pattern pieces, and don’t be scared to make adjustments to make things look more like the dress you want to create. Look at extant dresses you like to see things like proportion and seam lines, and try to recreate these lines in your mock-ups. Remember: a pattern is not the law, it’s only a guide, and changing it is allowed! When I like an adjustment I’ve made to a pattern piece, I transfer the piece with the adjustment to a new piece of paper, and put it in with the pattern, so that I can make that change–whether it be a higher or lower neckline, more or less gathering, or a narrower or wider back–whenever I like. Don’t be scared! The worst you can do is waste a bit of mock-up fabric–use something cheap like muslin, or sheets from the thrift store–nobody dies! Play around until you get something you really love. Now we get into the really fun parts: the pretties! There are zillions of ways to add personality to your Regency gown through trimmings. This is another place where you will really want to dig through fashion plates and paintings from around the year you would like to portray–you will find an endless variety of ribbons, trims, lace, contrasting silk, ruffles, ruching, appliqué, and other creative things I’m not sure there’s even a name for. There’s far too much variety here for me to go into everything, so here are some of my favorite examples of wonderful Regency trimmings. As you can see from these examples, you can choose just one for a simple, elegant look, or mix and match multiple kinds of trim to create layers of detail. Always use your specific year research as a guide. Pinterest can be a wonderful way to find research, but make sure that you follow the links and ensure that information is coming from reliable sources like museums or universities. Spencer, ca. 1815, Chertsey Museums. This is a great example of two of my favorite Regency era embellishments: dagging (triangle shaped/jagged trim), and rouleaux trim (tubes of fabric used to create a design). Military inspired dress, ca. 1815, Pavlovsk Historical Site Musuem. The military detailing on this bodice was extremely popular throughout the Regency period in different forms. This dress is also trimmed with satin ribbon, fringe, and ribbon roses. Embroidered dress, ca 1798, Metropolitan Museum of Art. Embroidery can be a time consuming choice, but if you enjoy doing it (like I do! ), you will be sure to stop people in their tracks! Dress, 1810-1815, Metropolitan Museum of Art. This simple dress has a lovely ruched bodice, puffed sleeve caps, and wide tucks at the hem. Net Overdress, 1805-1810, Metropolitan Museum of Art. This beautiful net dress is ornamented with embroidered lace, and would be worn over a colored bodiced petticoat. Evening Dress, ca. 1818, Metropolitan Museum of Art. The hem of this glorious gold dress is trimmed with swags of lace and silk wadding (tubes of fabric stuffed to give dimension). Dress, ca. 1815, Nordiska Museet. Contrasting ribbons are a fantastic way to add interesting detail without too much work. I also love the tiny little sleeve caps on this dress. No matter how lovely your gown, or how perfectly shaped your undergarments, your bound to look (and feel) a bit naked without at least a couple additions to your outfit. I’ll begin with the most obvious: a hat or bonnet. It would be very unusual for a lady in the Regency period to venture far out of doors with nothing to cover her head. Luckily, there are many options available to you. A quick search of Etsy for “regency bonnet” will turn up hundreds of items for your perusal, but as always, use caution in choosing. Consult your research, and remember, just because something is labeled “regency bonnet” doesn’t mean that it is suitable for the particular part of the Regency which you are portraying (or in some unfortunate cases, suitable at all). Find examples that resemble your research, and always trust sources from the period more than anything else. On Etsy, Regency Regalia, and 1800s Millinery Shop have some lovely examples available–but there are many other shops that sell Regency bonnets as well, so don’t limit yourself to just the ones I can remember! If you would rather see and try things on in person, Lydia Fast, and Shocking Bad Hats will be there at the Louisville Festival with their beautiful wears. My Lydia Fast bonnet is one of my most treasured possessions! Both shops also take custom orders. If you are feeling ambitious, there is really nothing to stop you from venturing into the world of millinery (hat-making) yourself. It’s an enjoyable branch of sewing that can give your brain a welcome break from dressmaking. There are several patterns available from Timely Tresses, and Lynn McMasters. Making your own bonnet will allow you all the creative control you desire! Now lets talk about the plethora of other, less iconic accessories available to the fashionable Regency woman. Louise de Guéhéneuc, duchesse de Montebello by Pierre-Paul Prud’hon, early 19th century. Her accessories include an elaborate lace cap, lace fichu tied around her neck, and a luxurious yellow shawl. Head of a Woman by Louis Leopold Boilly, 18-teens. Her accessories include a sheer cap, a red kerchief, some kind of frothy fichu in the neckline of her gown, and pink and white striped ribbon sash. Portrait of Countess Sheremetevs by Argun Nikolai, ca 1800. Her accessories include a lace cap with ribbons, a large red shawl, black reticule (purse), ribbon belt with jeweled buckle, gold necklace with a miniature portrait pendant, and a fan. Portrait of an Unknown Woman by James Ward, 1811. Her accessories include a cap, a beautiful chemisette, and a ribbon belt. Portrait of a Young Woman by Louis Léopold Boilly, ca. 1798–99. Her accessories include a white fichu closed with a red pin, and diamond-shaped earrings. Izabela Lubomirska with a statue of Henryka Lubomirskiego by Carl Hummel de Bourdon, 1816. Her accessories include a sheer cap with blue ribbons, cross-front chemisette with frilled collar, and beautifully woven shawl. Note that despite her age, she is dressed to the height of fashion for the year. Fashion and fripperies aren’t just for young ladies! Portrait of Theresa, Countess Kinsky by Marie-Louise-Elisabeth Vigée-Lebrun, 1793. Her accessories include a flowing yellow turban, an intricately wrapped and tied embroidered silk scarf, and coral jewelry. Duchess Charlotte von Sachsen-Hildburghausen by Heinrich Vogel, ca. 1815. Her accessories include an absolutely scrumptious ruff, and gold chain necklaces. Since I’m afraid of going on all day, I’ll just do a quick run-through of some of the most commonly seen accessory items. As always, remember to base your accessories on research from you own particular year of interest. Gloves–an absolute essential for the fashionable lady wandering about out of doors, or going to a dance. For day wear, I particularly recommend finding a pair of vintage kid gloves. If you can find ones that fit, there’s nothing more comfortable. They conform to your hands and fit like, well, a glove. For dancing, elbow length or longer is best. Try to avoid super-shiny costume gloves and seek out ones made of more breathable natural materials like cotton. Shawl–as you can see from nearly every image above, shawls were a must-have fashion item throughout the Regency. Particularly in demand were the enormous wool shawls imported from (or copied to look like those imported from) India. In general, these have a large area of solid color in the center, surrounded by a border of intricate woven designs. Caps–don’t let anyone tell you that caps are only for the old, or unfashionable! Also don’t let them tell you that caps are either a) only worn by married women, or b) required to be worn by married women. Caps are neither. There are images from the period of women in all stages of life looking absolutely lovely in caps, and just as many of women in all stages of life looking absolutely lovely without them. However, don’t let our modern prejudice bias you against this versatile piece of clothing! These garments provide a canvas for a wealth of detail: sheer patterns, lace, ribbons, flowers, pleats. Almost anything you can think of can be used to ornament the fluffy confection on your head. Caps can be worn by themselves indoors, or beneath a bonnet when venturing out, and they are a wonderful solution if you are having trouble getting your hair to behave. As with most items, caps vary widely over the course of the Regency period, developing to suit current tastes and to coexist with the fashionable hairstyles. Fichus–triangular scarves worn tucked into the neckline of a gown, or layered over the top to show off a sheer fabric or embroidered border. These are a nice, simple way to fill in a neckline for modesty, and protect your delicate complexion from a bit of sun. Very fine fichus can be seen both with day wear and evening wear. 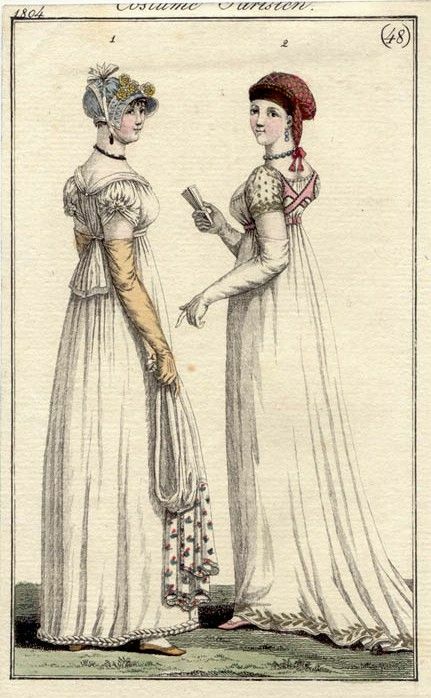 During the day, most women in the Regency covered their chest and collarbone area in some way. 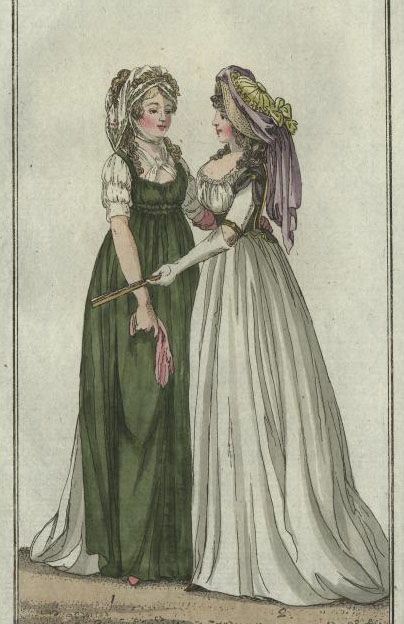 Fichus were particularly (though not exclusively) popular in the earlier Regency period, with chemisettes taking over the fashion a bit in the later Regency, though both styles appear concurrently for most of the time. I don’t mean to say that chemisettes were never seen in the 18-aughts, or that fichus ceased to exist in the 18-teens, merely that the bulk of fashion leaned towards one or the other at different points. Chemisettes–to our modern eye, a chemisette is most similar to a dicky. They are a small garment a bit like a partial undershirt, which goes over the shoulders and ties below the bust. They appeared at some point during the early Regency, and gained in popularity throughout the period. They feature every sort of collar that you can imagine from a simple Peter Pan-like style, to piles of ruffles, either closed at the throat, or open down the center, and everything in between. Many of these collars are reminiscent of Elizabethan ruffs and whisks. Ruffs–speaking of Elizabethan, if you’ve chosen to portray pretty much any part of the 18-teens, you can’t go wrong with a good ruff. The larger and more elaborate the better, especially as you get later in the decade. These could be either plain, embroidered, or lace, gathered or pleated, closed with a ribbon in front or back, or with an invisible closure. They could be worn with a chemisette, or on their own with a high-necked gown, over a spencer, or even on their own like a choker. There’s nearly no wrong way to do an 18-teens ruff–you can find period research to back up just about any style you can think of! 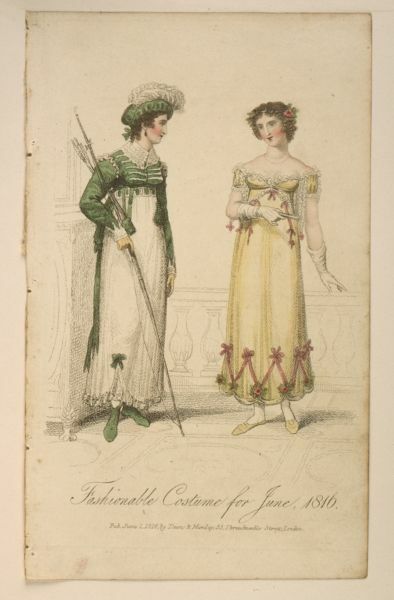 A few also appear in fashion plates from earlier in the period. Belts/Sashes–another item that appears throughout the period. A ribbon, or strip of matching or contrasting fabric at your waistline, either tied in a bow (front or back), or closed with a small buckle, adds a lovely touch to your outfit with very little effort or expense. Reticule/Ridicule–a small bag, usually with a drawstring closure. They are generally made of silk, but there are also lovely netted examples and other varieties. They come in many shapes from a basic flat pouch, to fascinating 3-d polygons, and can be a wonderful canvas for embellishments like embroidery, ribbons, and tassels. Luckily for us, shoes in the Regency are relatively simple: for the most part, women’s shoes are either slippers (flats), or boots about ankle or low-calf length. There is some variation over the course of the period as things like heel height and toe shape changed with fashion. Slippers in general shifted from a long, pointed toe with a curved opening for the foot in the 1790s, to a more rounded point with a squared-off opening later in the period. Both leather and fabric uppers are plentiful. Looking through extant examples, you can find a staggering wealth of detail: brilliant colors, various materials, patterns, ribbons, rosettes, embroidery, bows. A little detail like contrasting ribbons, or clip-on rosettes can make a huge difference to a store-bought shoe. Boots followed a similar trend of pointy to rounded toes over the course of the Regency period. The shafts also began to get shorter as the 1820s neared. Most were made of either leather or sturdy fabric–generally Nankeen imported from China, and though as more utilitarian outdoor wear, they didn’t come in for quite the share of embellishment that slippers did, they can be seen in a wide variety of colors, and some do sport interesting details such as bows or fringe. Luckily, many modern shoes can manage a creditable Regency look, as long as you are willing to put in a bit of patient work to track down ones that look right, or a bit of work to add some period details. If you’re ready to jump in with both feet, you can purchase beautiful reproduction shoes from American Duchess. They have some lovely stockings available as well. You can also purchase lovely boots from The Bohemian Belle, She will be at the Louisville Festival, and carries many other gorgeous Regency accessories, including stunning replica tiaras. Reproduction Tiara from The Bohemian Belle. My favorite part about Regency jewelry is that it’s just as lovely now as it was then–I wear my reproduction pieces all the time in my every day life! You’ll see everything from simple strings of pearls, gold beads, or coral, to elaborate jeweled parures with intricate goldwork. This is another place where I could easily fall down a rabbit hole of posting photos forever, but I’ll let you do that on your own. Here are just a few gorgeous examples, both extant, and in portraits. There is also jewelry to be seen in the portraits above! These jewelers are all incredible artists who put research and time into their work. Keep in mind though, they all work in multiple periods, so not everything they make was fashionable in every time period. They all show their research on many of their pieces, but always make sure that you can back up your jewelry choices with your own period research! Just because a lovely pair of earrings is pictured next to a portrait from the 1750s, doesn’t mean that style wasn’t also popular in the 1810s–if you rely on yourself, rather than others, to do the research, you may open up a world of new pretties for yourself! Like most things in the Regency period, hairstyles varied greatly across the decades. The early 1790s started out with the hairstyles that had come into fashion in the 1780s–a large mass of soft curls generally called a ‘hedgehog’, usually with looser, dangling curls at the bottom. As we rounded the turn of the 19th century, the styles shrank, and the curls became softer and less structured. The bulk of the style moved from the top to the back of the head. The idea was to mimic the silhouette of styles seen in Ancient Greek art, which was much in vogue. Wrapped ribbons and scarves were the height of style in hair accessories. Early in the new century, the long dangling curls began to disappear, creating hairstyles that sat on the back of the crown, close to the head. The curls remained soft, but where before they were dispersed all over the head, now they tend to be concentrated along the top of the head, leaving a more obvious upsweep of hair towards the bun at the back of the head. We are also just beginning to see the formation of the center part that will remain part of the style for decades to come. This style is soft, contained, and easily covered by the tight-fitting jockey hats that were very much in fashion. Later in the 18-aughts, and into the early 18-teens, the styles were becoming more segregated, with the curls at the front and the bun at the back as two distinct sections of the style. The bun is at the point of the crown, and is large and quite flat. The curls at the front are more individual and distinct than before. In the mid 18-teens, the styles moved higher, so that they sat atop the crown of the head, making the bun entirely visible from the front. They tended to be wider from the front and narrower from the side, although this is not a rule. The curls at the front were usually very small and contained at either side of a slick center part. Towards the tail end of the teens, the buns underwent a brief flattening and widening before springing up with a vengence into the Apollo knot hairstyles of the 1820s and 1830s (if you don’t know what these are, do yourself a favor and Google it). The most obvious change, though, is the usual size and amount of front curls. The slick center part remains, but is longer–you can see the difference in part length between this and the portraits above. There are several inches here, only about an inch in the mid-teens, and a fraction of an inch in the late 18-aughts. Because more hair is included in them, the curls are larger and more substantial. In this portrait, rather than ringlets, each side consists of three rolls of hair, stacked one on top of the other, which create a widening effect and the illusion of a heart-shaped face. As is always the way with fashion, there are no hard-and-fast rules here. I have given a general overview, but in period images you will find lots of overlap, and a huge range of styles based on varying interpretations of the norm, and on personal taste. As always, women found ways to tweak the styles in ways they felt suited them, and you can too. Where is the bulk of the style? In other words, where is most of the hair? If there is a bun, where does it sit? On top of the head? Right on the crown? On the back of the head? Is the bun curly, or is it smooth? Twisted? Braided? Where are the front curls? At the top of the head, or towards the sides? Are there front curls at all? You sometimes also see simple updos or side braids, particularly in the 18-teens. How many curls are there? What size are the curls? Large or Small? How much hair is in the curls? It is especially helpful to look for part lines here, so that you can determine where the hair comes from. Is the hair sleek and close to the head, or does it have volume? Is there loose hair in the back? Curled or not? If you are interested in working with period styling products and other cosmetics, be sure to stop by LBCC Historical, who will also have a tent at the festival. Nothing will make you feel like a real Regency lady like practicing a bit of deportment! Remember your posture–your stays will help with this, but keep your mind on it as well! Keeping your back straight will also help you enjoy yourself all day in period clothes without ending the day with a sore back. Try not to hike up the front of your skirts. Taking slightly smaller steps will help keep your toes from catching your hem, and will make you appear more comfortable and graceful, especially if you are unaccustomed to long skirts. If there’s real danger of dirt and mud, gathering up the back volume of your skirt into one hand and holding it up and to the side will help more than anything. Since there is more volume there, it is more likely to hang lower than the rest of your hem, and as you walk, your feet splatter mud backwards, so you are much more likely to soil the back of your dress than the front. Try a curtsy or two! Sweep one foot behind the other and bend gently from the knees. Sink straight down, keeping your back straight, and bowing your head towards the person you are greeting. You don’t want to sink too low in this period, as the narrow skirts can cause ungainly bent knees to show. A slight lowering is all that is required for all but the most illustrious personages. A curtsy or bow is a mark of respect and acknowledgement for the people around you. 9. Don’t think of it as a costume. Spending a happy day in period dress is all about attitude. If you think if it as a costume, your outfit will feel like something strange, unusual, possibly uncomfortable. You will focus on how it feels different from your normal clothing, and find it distracting. So don’t think if it that way. For today, these are your clothes. They’re just what you’re wearing, nothing strange about it. It may seem simple, or even silly, but changing this one little point of view makes all the difference in the world between wandering around in the 21st century while wearing a period costume, and truly immersing yourself in the period. The less distracting you find your clothing, the more attention you will have left to enjoy all the fun of the Festival, or whatever Regency event you happen to be attending, so put on your clothes, know you look fabulous, and go have the time of your life! Read Leveling Up Your Regency Look: Part 1! Welcome to Tambour Lace, Lesson 2! If you are just getting started, here is the link to Part 1, where you can learn the basic stitch, and how to finish the ends. Now that you know how to get started, and do the basic stitch, you may as well start embroidering things a bit more fun than straight lines. I’ll start you off with something nice and simple. For this tutorial, I just sketched out a little gently curved vine with small, rounded leaves. It’s a motif that appears often in embroidery from the early 19th century, so it’s one I’ve done a lot. You can extend this design to create a simple, lovely border for hems, ruffles, handkerchiefs, veils, sleeve cuffs, or just about anything! Step 1: Transfer your design. The first thing we need to do is get the design transferred onto our netting. I do this in one of three ways. With a water-soluble fabric marker. I would have done this for this tutorial, but the only one I could find in my house was a white one, which would be absolutely useless on my white fabric! This method is fast and easy to remove, but no good if you’re planning to use the piece you are working on as a period demo. With pencil. This method is also quick, which makes it my go-to. Pencil is dark enough to see well as you work, but generally rubs mostly out by the time a project is finished, and only needs a quick wash to remove it completely. If you are someone who stresses a lot about being able to remove the markings, though, I wouldn’t recommend this for you. With a basting stitch. This is the superior method I have found, but it also takes a good deal more time and patience than the other two, so I often rule it out as too time-consuming. You simply run a basting stitch around the design with a needle and fine white thread. Later, you can either pull it out, or leave it in and trim the ends, as the tambour-work usually obscures the basting completely from the front. With any of these methods, I start by pinning the fabric down smoothly and securely over the design. You want to make sure it moves as little as possible while you are copying. The pencil looks frighteningly dark while it’s over the paper design, but most of that is really just the drawing showing through. Since I am right-handed, I like to begin at the top left corner of the design, and work my way down and too to the right. That way my hand can’t smudge the pencil as I go. Step 2: Find your path. Many designs are easy to work out, you can see the path you will take just by looking, but if you are having trouble I would suggest copying your basic design on a piece of paper, possibly blown up larger, and working out the path there before you begin stitching. Believe me, it’s very annoying to get through most of a design and realize you made a mistake, and can’t get where you need to go! The last thing anyone wants is more ends to weave in because you were forced to cut the thread prematurely. If you read Lesson 1, then you already know how to start your thread, and you’re ready to begin stitching. Bring your thread up at the base of the stem. Begin to work the basic stitch you learned in lesson one, up and over the top of the first leaf. You could begin with either the left or right leaf, it makes no difference, as long as you follow the pattern. Sometimes, as you work, there will be no cell in your direct path, and moving to either side would distort the design. In this case, you may have to skip over a bar between two cells in order to get to the next available cell. These stitches will be slightly longer than the others, but not enough to be obvious in the design. Make sure you do not pull the loops too tight, or you will risk puckering the fabric. Continue down the bottom of the leaf, and up over the top of the adjoining leaf. Where you cross the original line of stitching, you should be able to stitch right over and into the same cell as your previous stitch. You don’t want to skip over a cell completely as this will create one longer stitch, which can detract from the beauty and evenness of the work. Continue to stitch around the bottom of your second leaf until you reach the place where the threads all meet in the middle. At this point, in order to maintain your neat, even stitches, and to keep the design crisp, you will need to stitch down through place where all your lines of stitching meet. There won’t be room anymore to simply stitch in the same cell, and you will have to go through the center of your previous stitches. Move slowly and carefully, especially your first few times, and don’t get frustrated if your hook catches in the stitches as you pull the thread back through. Minute rotations of the hook are usually enough to help you find a place where it can come through. This part can be a bit tricky, but the result you get will look much nicer than skipping a stitch over the area. Continue up the stem and work the leaves as before. As you go, insert your hook each time in the next cell that most closely follows your sketched design. If you are unsure exactly where to go, err towards the outer edge of the pencil line as you get used to going around these small curves. Once again, we will go over making sharp points next time! As before, if there is no good cell to go to, skip over a bar, and make your stitch in the next available cell. Repeat this process over and over until you come to the final leaf. Stitch up and around one side of the leaf, which way you go makes no difference. Continue around until you get back to the point where the leaf meets the stem. Make your final stitch in the same cell as the end of the stem, and pull your thread out long. Clip the thread under your work, being sure to leave enough of a tail to weave into the back of the design. Make sure you don’t pull on the thread while you do this! The last thing you want is to pull out your lovely work before it is secure! Return to the front of the work and pull the long thread loop until the tail comes up to the top. And use your hook to pull the thread tail back down through the same cell but crucially, NOT through the last stitch you created. And there you have it! Simply weave in your ends as you learned in Lesson 1, and your work is done! Once again, if you have any questions, or requests for future tutorials (tambour or otherwise), don’t hesitate to ask! The Jane Austen Festival in Louisville is fast approaching! Are you looking to amp up your Regency costuming experience? Maybe you love the festival, but have never dressed up. Maybe you made a dress last year, and are now intrigued by the whole idea and want to know how to make it more authentic. Maybe you’ve been inspired by the outfits you’ve seen at the festival, or in photos, but you don’t know where to start. Maybe you’re coming for the first time, and just want to jump in headfirst. Whichever, if any, of these describes you, I’m here to help! 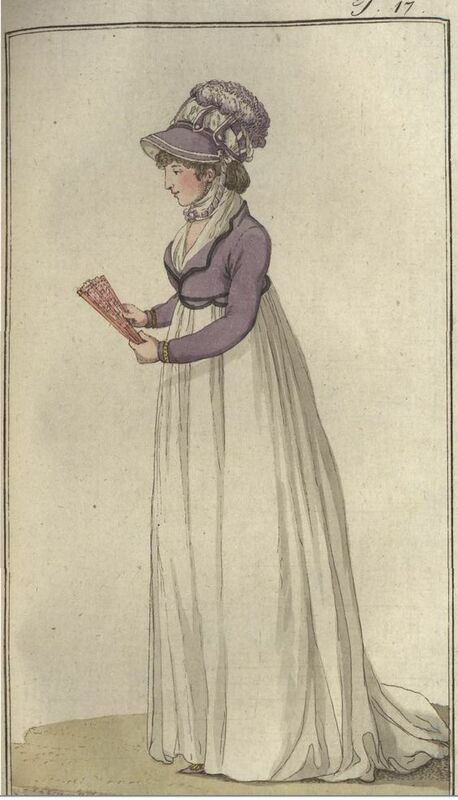 On the surface, Regency era clothing seems simple: empire waist dress, hair in bun, bonnet, slippers, done. And that’s all fine! I’m not here to tell anyone they can’t have fun in the basics. Costuming for an event like the Jane Austen Festival is all about finding an outfit that makes you feel comfortable and happy so that you can enjoy yourself! But if you’re ready to dig deeper, there’s so much more to Regency fashion than the basic sketch. I’m here to guide you through and help you get the most out of the six weeks (yikes!) that we all have left to get ready for the Festival this year! 1. Which part of the Regency? While technically the actual Regency of Prince George for his father, the infamous Mad King George, lasted from 1811-1820, for the purposes of fashion, we usually look at a larger period. Using a broader definition of the Regency, from around 1790-1820, makes particular sense when we’re talking Jane Austen since, though her publishing history all lies within the political Regency, several of her books were written, and are probably set, earlier. So we’re looking at a thirty-year period from 1790-1820. Fashion, even if the basic forms remain similar, can change a whole heck of a lot in thirty years, as any three decades of the 20th century can tell us, and there’s no one item of clothing that was fashionable through all thirty years, except maybe your stockings and shawl. We begin in the early 1790s, when the fashionable silhouette still has as much in common with what we think of as 18th century fashion as it does with any part of the early 19th. 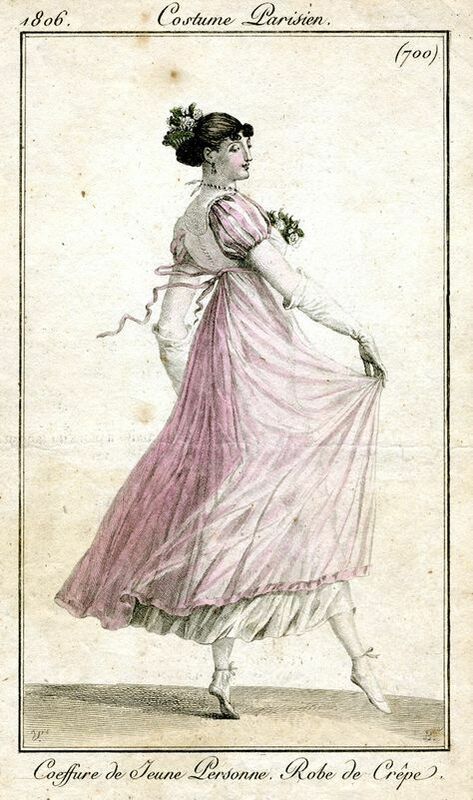 The waist is still more natural, expanding into a large volume around the hips, with a large “pigeon-breast” created by a voluminous handkerchief wrapped around the shoulders and stuffed into the front of the dress. Despite the silhouette, however, you can see how this fashion is moving away from the stiff, heavy under-structure of the mid 18th century, and towards the lighter, more diaphanous fabrics we associate with the Regency period. As we move through the decade, you can see how wide ruching at the waist, or a wide sash, both of which cinch in the fluffy volume of fabric above and below the waist, begin to create the appearance of a higher waistline. As fashion moves forward, this separating band between skirt and bodice will grow smaller and smaller until it creates the empire silhouette we all know and love. Hairstyles, however are still the fluffy confections with dangling curls that we have been seeing since the 1780s. Keep an eye on those turban-like headdresses, though. Those are coming forward in time with us. 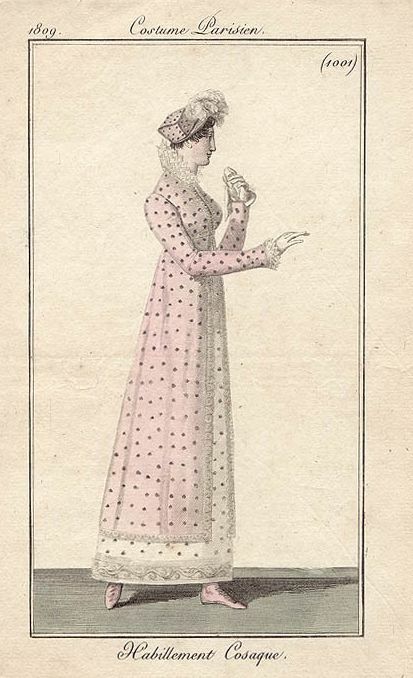 By the time we hit the late 1790s, the silhouette has come to distinctly resemble our basic mental picture of “Regency.” Here is the empire waist, the bonnet, the short Spencer jacket. But here we can also see the continuing influence of the 18th century. The skirt is still heavily gathered and voluminous, though some of the under-structure and padding that gave it its shape even a few years ago are gone. There is still a hint of the pigeon breast, which will hang on for several more years before a new bust shape takes its place. Now we come into the early 19th century, and the Empire silhouette really starts to come into its own. The skirts, while still full and gathered all the way around the waist, have less and less support underneath, so they have become drapier, and more column-like, with elegant trains or ‘sweeps’ at the back. The hair is shrinking down as well, though it tends to retain the frizzy curl of the late 18th century, reworked into a different shape. As we continue on into the 1800s, the skirts are becoming narrower in the front, with the volume beginning to concentrate at the back. This trend will continue through the rest of the period. You can also see examples of small hem decorations. The woman on the left has a braid of fabric around her hem, while the woman on the right seems to have embroidery. Notably, one of the dresses has lost its train, making it more convenient for walking. The busts are losing the rounded, pigeon shape, and beginning to migrate higher in order to make way for ever-higher waistlines. The hair is small and contained at the back of the head. In the late 18-aughts, the trend of “lift-and-separate” as the fashion for bust shape is really beginning to take off, though you can still see a natural amount of chest and collarbone above the bust. You can also see that the skirt volume has completed its migration to the back of the dresses, creating an elegant sweep even without the added length and weight of a train. Hemlines have risen enough to show most of the foot. We are also seeing much more pattern and color than we have in the gowns up until now. These ladies are demonstrating both an evening look with very small short sleeves, and long gloves, and a walking dress with long, narrow sleeves topped by sleeve caps that mimic the short sleeves. As we move into the early 18-teens, you can see that the bust has risen considerably above where it was even four years ago, and is beginning to encroach on the collarbone. This lift is created by the long stays of the period, and will become even more pronounced as the decade goes on. The waist, however, has not yet migrated up to meet the higher bust line. The hem of the skirt is beginning to widen towards and A-line shape, but there are still minimal petticoats underneath, so it retains its fluid drape. The front of the hair is growing slightly more elaborate, but most of the hair is still concentrated at the back of the head, so we cannot see the style from the front. Now we come to the part of the Regency in which I usually live. As the 18-teens move along, embellishments become more and more elaborate, with hem decorations ranging anywhere from a single ruffle to an elaborate confection that nearly reaches the knees. Long sleeves were very fashionable for day wear, and sometimes for evening dress. The narrow sleeves with larger cap were still around, especially on outerwear, but even more prevalent were large, loose sleeves, gathered in at the wrist, such as the extremely elaborate ones on this fashion plate. For Louisville in July, I absolutely love these sleeves. Made from a lightweight cotton, they keep the sun off while acting like an enormous fan on your arm. Day dresses are often made with high necklines, accented with elaborate ruffs or lace collars. Waistlines are as high as they can get without actually migrating above the bust, and in order to make this possible, ‘the girls’ are hoisted as high as a good pair of stays can get them, with virtually no flat collarbone/sternum area between bust and neck. See how the skirt appears stiffer here than in our 1812 example? The volume continues to grow at the hem, and it is now supported by several layers of petticoats stiffened with tucks or ruffles and starch. Hemlines are rising still more, and dresses in this part of the Regency often show the entire ankle. The bow at the back of her waist is highly fashionable in the mid-18-teens, and her hairstyle is now sitting on the crown of her head. This fashion in hair also affected the fashionable bonnets, which had to grow high crowns in order to accommodate the style. And here in the late teens, the Regency style is cresting its wave, and about to move on into the lower waistlines, wide shoulders, and enormous, bell-shaped skirts of the Romantic era. The waistline is still high in the late-teens, but won’t remain so for long, as the fashion began to move lower and lower over the next several years. The decoration is still elaborate, but the hem is widening yet more, and dropping down to cover more of the leg, though shorter styles remained in vogue for dancing. The bonnet is growing even more, and the brim is not only wide, but very tall and open, creating an oval frame around the face. Underneath, the hair is still high on the head, and the styles are getting wider. The change over the course of the Regency period is gradual, with one style leading gently into another, bit by bit, but over the course of thirty years, these gradual changes add up into a vast difference in style from one end to the other. Compare our first image with the last one: the two are vastly different, and yet clear, minor changes, year by year, led from one to the other, and both looks are beautifully appropriate for the Jane Austen Festival, although the last image is from two years after her death. You can see from this timeline how important it is to narrow your look down to a specific point within the broader Regency period. 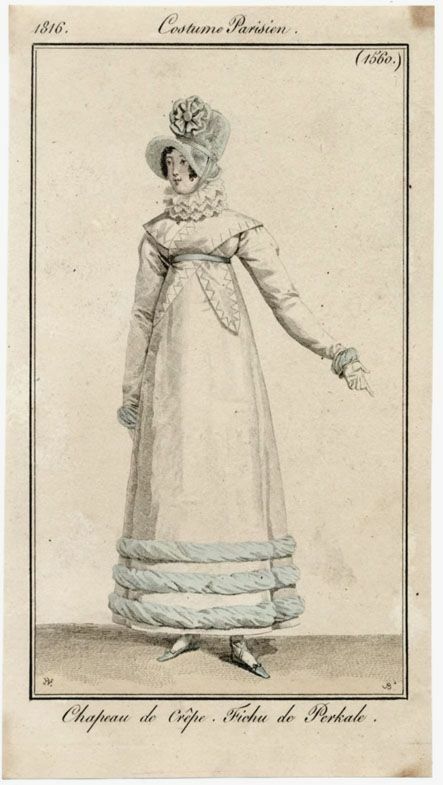 A gown from 1792, with a spencer from 1812, and a hat from 1818 would all look very strange together, because each of these pieces of clothing co-developed with one another as time went on. The 1812 spencer is perfectly suited to complement an 1812 gown. A dress from 1790 looks beautiful with its own understructure of false rump and petticoats, but very odd with the minimal underskirts of 1808. A tall 1819 hairstyle would be destroyed by the neat little hats of 1804. Though it may seem limiting, narrowing yourself down will make coming up with an outfit much easier. Looking at images from the whole of the period can get extremely overwhelming, but once you have picked a year, or at least a small period of 3-4 years, it will become a lot easier to make decisions. It will also ensure that each part of your outfit complements the rest, and you will look like you stepped right out of a fashion plate. There are many ways to pick which bit of the Regency you would like to interpret. The most obvious is to pick the part that you find most attractive, or that you think will look best on you. If this doesn’t help, start by thinking about your favorite Austen book, when was it written? Published? When does it take place? Would you like to bring to life the heyday of Jane’s youth in the 1790s, or would you prefer to live for the weekend as one of the public who first got to enjoy her works in the 18-teens? Once you have figured out when you want to be, there are several other factors that will help you in creating the perfect outfit. 2. What time of day is it? What sort of activities will you be doing? 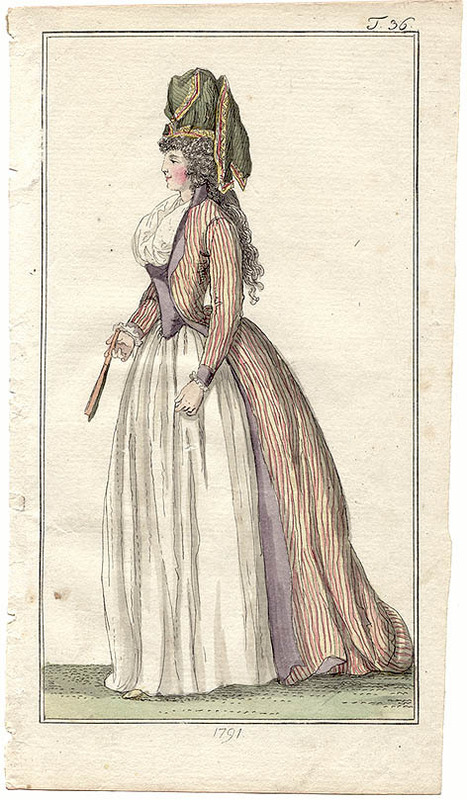 Throughout the course of the Regency, day and evening dress differ. Women tended to be mostly covered from neck to feet during the daytime, while evening dress tended towards lower necklines, and more bare arms. Fabrics also differ. Day dresses are mostly cotton or linen depending on status and the exact time period, while both silk and cotton were fashionable in the evening. As with everything, there are no set rules that apply to the entire period. Use your chosen date or date range to guide your research. Think about what you might be doing–if you are planning to attend the ball, do you want to dance, or simply to observe and play cards? If you are dancing, you will need to think about how your dress will affect that. Is there a train that needs to be pinned up? If you are interpreting a part of the period where shorter hemlines were in vogue, I would advise that you take full advantage of that for your evening gown. If you do not plan to dance, explore the wonderful world of “evening dresses”, “opera dresses”, and “dinner dresses” to provide the event with a bit of variety. Not every dress worn in the evening needs to be a ball dress. For daytime, a walking dress or promenade dress is the obvious choice for strolling through the shops of Meryton and taking tea with friends, but it is not the only choice. Are you a sporting lady? Consider the fun of an archery dress, or the elegant simplicity of a riding habit. 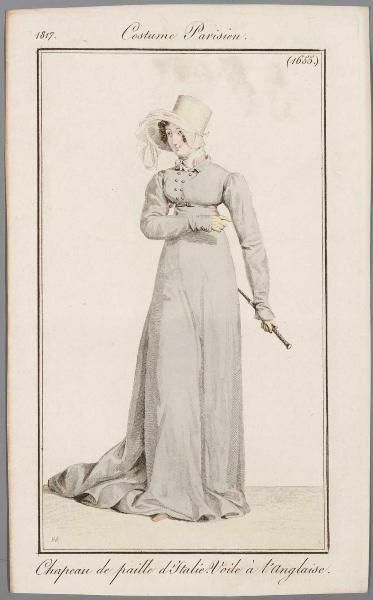 Riding Habit, Journal des Dames et des Modes, 1817. 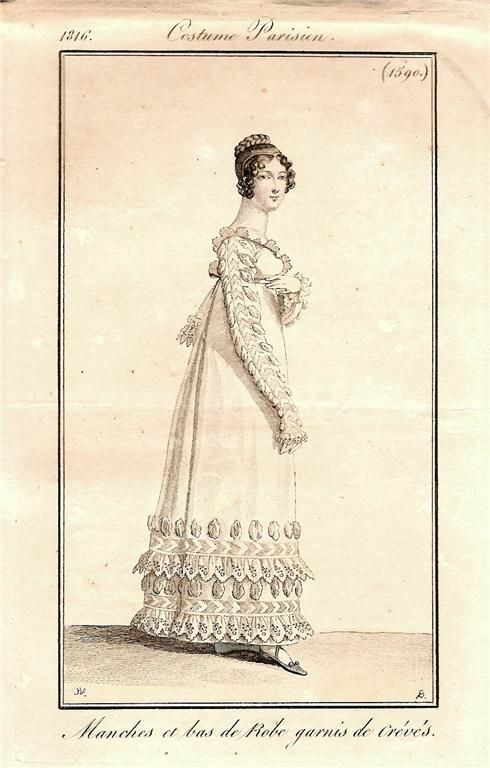 Note the style differences and similarities between this and the dress from 1816 that we looked at earlier. While riding habits did develop with the rest of fashion, they also maintained their own very distinct appearance. If you are interpreting the mid-late 18-aughts, you may want to wear a short sleeve with long gloves for day time. If you are looking to the 18-teens, consider a long, loose sleeve. Remember the two part sleeves from earlier, with the narrow long sleeve topped by a puffy short sleeve? Those long sleeves can simply be basted to the band of the short sleeve, so that they can be removed if you would like to wear the dress with short sleeves for evening-wear. Plenty of people won’t want to make two different dresses for day and evening, especially if you only dress in Regency clothes once or twice a year. Don’t worry, there are plenty of options to make a single dress do double duty. Many Regency dresses have low-necklines, with the necks filled in by any number of things during the day. In the very early Regency, this might be a large square or triangular handkerchief. Later on, you could wear a light fichu (a smaller, usually triangular or modified triangle-shaped scarf that either tucks into, or sits atop the neckline of your gown). Later still, the chemisette comes into fashion. This is an undergarment much like a dicky which closes around the neck, and ties under the bustline, worn with any number of interesting collars or ruffs. It’s relative, the habit shirt, also has sleeves, and is lovely with a jumper-style gown. Journal des Dames et des Modes, 1816. This walking dress has been accessorized with a fichu and ruff. In the evening, simply remove your fichu, chemisette, etc… and you have a whole new look. The same thing can also be achieved with an outer garment. During the day, you can cover your bodice with a spencer (short jacket) or pelisse (long coat). These can be made of light materials so as not to add too much heat, and the pelisse can be left open down the skirt front. Both can add a lot of fun to your outfit. By changing out fichus, chemisettes, spencers, and pelisses, you can have a different outfit for each day of the festival out of a single gown. Journal des Dames et des Modes, 1809. Look just how light and lovely a pelisse can be! Ok, you know when in the Regency you want to be, and you know what time of day or activities you are dressing for. What more planning could you need? What class are you from? Are you a Bennett? A Bertram? A Smith? Or are you a Mrs. Hill? Wealthy, poor, or somewhere in between? What do you like to do? Would you rather lounge around in a morning dress à la Lady Bertram, or traipse about the countryside? What is your personality like? Are you a Mary, or a Lydia? Introverted or extroverted? Plain, practical clothing, or daring frippery? Perfectly appropriate to any occasion? Likely to make a gaffe? What are you attracted to? Piles of ribbons, oodles of ruffles and lace, or sleek, clean lines? How old are you? Does this affect how fashion forward you are? Are you nostalgic for the past, or do you still love to keep up with the latest styles? What do you (or your character) want to show the world? Are you Lady Catherine, determined to project power and control? Fanny Price, always happier to fade into the background? Mrs Weston–suddenly thrust into a higher rank of life, or Miss Elliott–desperate to embody a level of wealth you no longer possess? There are no wrong answers to these questions, simply use them to direct your research and help you narrow down an idea of what you, or your character, might have worn in this period. Looking at portraits and genre paintings from the time is a great way to get a sense of what people of different classes and personalities were wearing. Look at the paintings below. What do the ways the subjects have chosen to be portrayed make you think about them? This part has been a basic overview of the period, with some tips on how to make your outfit specific to the period, and right for you. Next time, we will look at some of the details that make a Regency outfit really come to life!